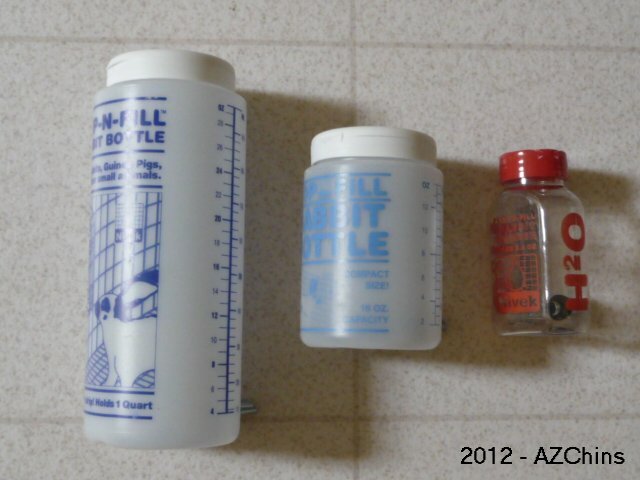 Description: These are Nivek bottles with a lever type nozzle that does not leak. Transport bottles will not leak even if taken on a bumpy car ride. Each bottle has an easy to fill flip top design. They come with a guard to deter chewing of the bottle, if requested. The bottles are plastic, so care must be taken in the placement of the bottle. There is a transport size (5.5 oz), the smaller 12.5 oz size that works for maybe two chins and the large 32 oz size for cages with multiple chins. The bottles do not rely on the old fashioned vacuum concept where the water bottle must be kept full at all times to prevent it from dripping. They empty with gravity so that the air and water do not have to pass through the nozzle. Only water comes out and nothing from the chin's mouth gets sucked back into the bottle. This keeps the bottle from growing as much bacteria since less debris is getting into it. These are easy to clean with a wide mouth opening at the top. Scrub your bottles out a minimum of once each week. This will prevent bacteria from growing and making your chin sick. We use reverse osmosis water with the chins here to ensure that they get water free of contaminants. 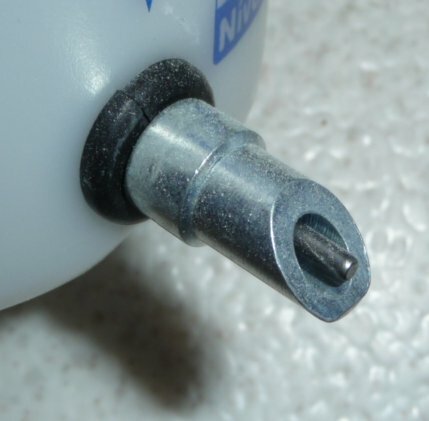 Drip and leak resistant lever nozzle.